Throwback Thursday – this is a weekly event hosted byJenny at Take Me Away! It is the time each week to recognize those older books… an older book you’ve always wanted to read, or one that you have read and love; maybe one from your childhood; or review an older book -- how about even a classic! Head on over to her blog, join and let's reminisce! You guessed it, "Flowers for Algernon" by Daniel Keyes. It's been at least 17 years since I read it (I am basing this on most likely having been back in 8th grade when I read it), I can't write a review but I really want to reread this. What a classic! "Daniel Keyes wrote little SF but is highly regarded for one classic, Flowers for Algernon. As a 1959 novella it won a Hugo Award; the 1966 novel-length expansion won a Nebula. 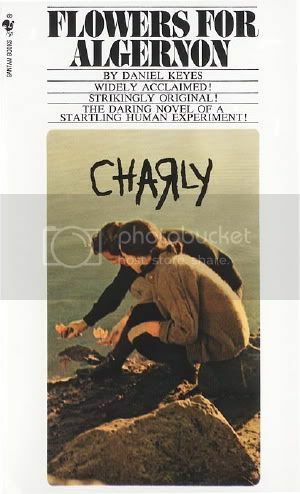 The Oscar-winning movie adaptation Charly (1968) also spawned a 1980 Broadway musical. Flowers for Algernon is a timeless tear-jerker with a terrific emotional impact. --David Langford"
Either ways, what's YOUR throwback? Excuse my ignorance, I've never heard of this one but it sounds wonderful. I agree with you, I get teary with the books that touch close to home in some way. I think it's one of those books that is easily forgotten and easily remembered and makes you say "Oh yeah!" Definitely pick it up if you ever get the chance! I have never heard of April Fools Day. What bleeding disorder does your son have? That has to be hard!